This is my favorite movie of all time, but you already knew that. Oh yeah. Mine too. Japanese people think I'm making fun of them when I tell them that it mops the floor with Kurosawa, Ozu, etc. 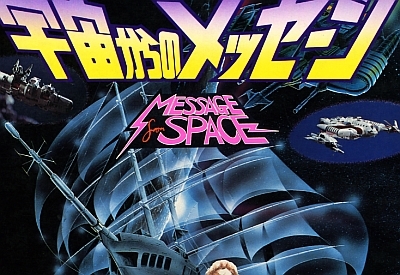 I love the little 'lightning bolt' tails on the 'M' and 'E' in 'Message from Space'. Somehow it just fits. Don't leave me out,it's one of my faves too! I had a friend who was SO OFFENDED by this movie he ranted for years how I had 'tricked' him into paying to go see it. He just never saw the coolness of it.